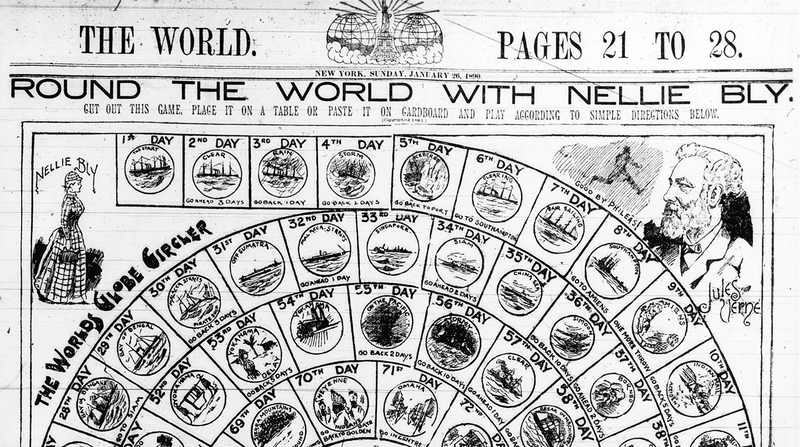 A board game based on Nellie Bly’s epic journey. Bly’s trans-world journey was an attempt to break the fictional record of the equally fictional Phileas Fogg, title character of Jules Verne’s 1873 novel “Around the World in Eighty Days.” Given approval to try the feat by the New York World, Bly embarked on her journey from New York in November 1889, traveling first by liner but later also via horse, rickshaw, sampan, burro and other vehicles. Bly managed to complete her trip in 72 days, 6 hours, 11 minutes and 14 seconds—setting a real world record. Bly earned international stardom for her months-long stunt, and her fame continued to grow after she safely returned home and her record-setting achievement was announced. 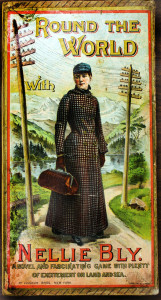 Bly later published a book about the experience: “Around the World in 72 Days” (1890).